Dressing window treatments is an art. Fit-ex use well tested techniques to ensure every treatment is dressed beautifully. When we leave your window treatment we will tie the curtains in place with soft polythene which will leave no crease but will ensure the drapes fold in the correct position for their lifetime. Steaming curtains is sometimes required to get rid of unsightly crease. With our profession Propress steamer we make sure the creases disappear. Fit-ex is striving to be the only national company dedicated to curtain fitting and blind fitting. Our image, of smart uniforms and liveried vans, sets us apart from every other curtain and blind fitter: we wear smart uniforms and drive liveried vans. 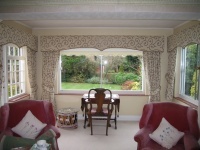 We fit for curtain makers and interior designers, providing a curtain and blind installation service. Fit-ex also supply corded curtain tracks, wood and metal poles if required. A professional measuring service is available for all types of window treatments, from bay windows to conservatory blinds. Fit-ex operators can install any hardware, with confidence, from any manufacturer: Silent Gliss, Byron & Byron, Integra, Luxaflex and any made to measure pole, track or blind.